Annual rainfall by month for Yap, Chuuk, and Pohnpei. Data from western regional climate center. The FSM is an independent nation encompassing over 600 high islands and atolls comprising 270 square miles and spanning 1,600 miles east to west across the western Pacific Ocean. The islands are politically organized among four states associated with the four main island groups of Yap, Chuuk, Pohnpei, and Kosrae. 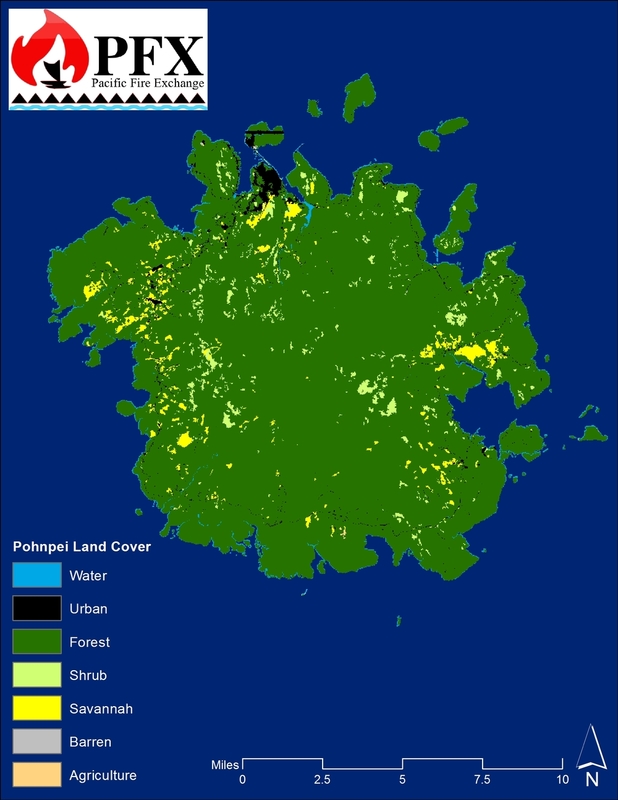 The region was settled by people several thousand years ago and evidence indicates the islands supported much higher population densities than at present with sophisticated agroforestry and fisheries management systems, many of which are still practiced at smaller scales today. The region is culturally and linguistically diverse and considered a biodiversity hotspot for its both marine and terrestrial ecosystems. Fire-prone savannas occupy each of the main high islands in the FSM to varying extents and are derived from a long history of intentional burning by people. These savannas consist largely of native grasses, ferns, and shrubs and are interspersed among tropical forests and agroforests, forming complex, mosaic landscapes. Yap, the westernmost high island in the FSM, has the largest expanses of savanna vegetation and fires occur annually during the dry season from January to May. Savanna extent declines along with rainfall seasonality moving eastward towards Chuuk, Pohnpei and Kosrae, but extensive fires have been reported from these moister regions during extreme drought conditions such as occur during El Niño events.